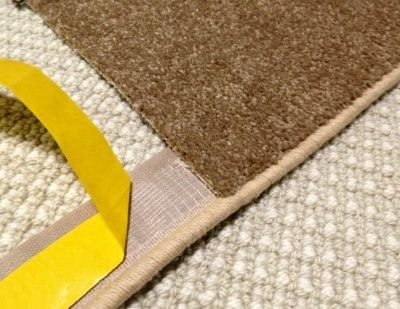 Instabind DIY Cotton Serge Style Carpet Binding- Bond Products Inc.
No need for an expensive serging machine to apply a beautiful serged edge. Repair oriental rug edges, finish roll runners, or just create high end look area rugs. Our cotton serge binding style Instabind is easy to install and available in 50 colors from our cotton serge yarn line. Standard stock roll sizes are 54 or 216 ft or you may purchase custom sizes by the foot at a $.40/ft up charge. We recommend that you use latex-based hot melt glue sticks for a long-lasting strong hold. Keep your carpet from fraying with Instabind cotton serge binding. Note: Rule of thumb for synthetic vs. natural fiber: if it’s a cotton or wool rug/carpet, use natural fiber binding or serging, i.e. cotton, if it’s a synthetic rug/carpet then synthetic binding or serging is appropriate (although cotton is still a higher quality look!). Please note that ALL custom cut PER FOOT orders are NON-RETURNABLE.